Hagerman Mennonite was started in the 1930s in what was then a small hamlet called Hagerman’s Corners. In the decades since, the community around the building grew with an influx of newcomers to Canada. In 1993, Markham Chinese Mennonite Church partnered with Hagerman. Now, a third partner, Markham Christian Worship Centre, a Tamil congregation, also shares the building. At a celebration on Oct. 14, 2018, the church unveiled its newly renovated building. The building had been “getting a little tired,” says James Barber, chair of discipleship at Hagerman Mennonite, who was also a member of the building committee. In addition to regular wear and tear, some aspects of the building didn’t fit congregational needs. He notes that congregants were visiting after services in a long, narrow room that he likened to a bowling alley. Reverend Paul Mo, Markham Chinese Mennonite’s pastor, also notes the long lines that would form at the washrooms after the service. 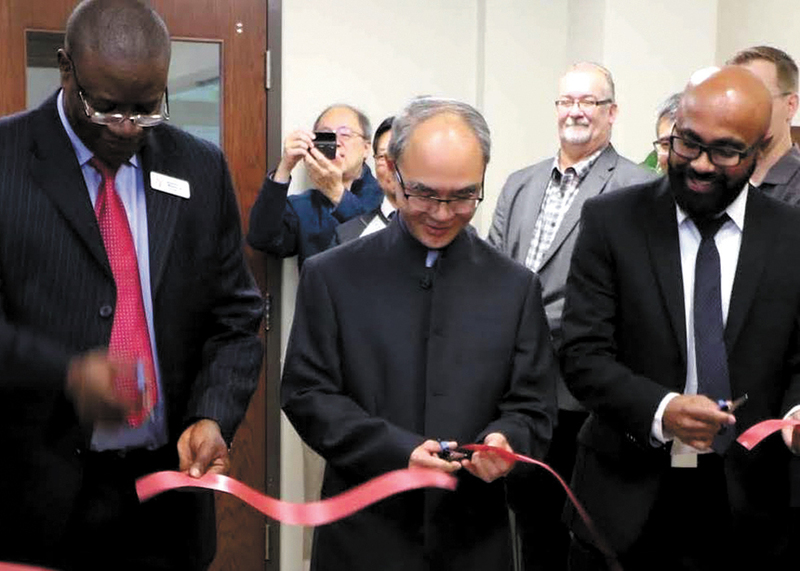 Now a welcoming entrance opens onto a large multi-purpose room with a café, new washrooms and four rooms that can be used for meetings or Sunday school classes, says Hagerman Mennonite’s lead pastor, Roberson Mbayamvula. The church’s two sanctuaries have been renovated, and the whole facility, on one level, is now fully accessible. The changes have “improved our space beyond our hopes and expectations,” he says. They began asking for help, according to Barber, and they got it. “Everyone came through, pretty much to the full extent we asked. And we made outrageous asks,” he adds, noting some people who are not regular congregants came through with six-figure donations. The pastors of the congregations agree that the church’s diversity is its strength. The three congregations have formalized their partnership with a covenant agreement, Mbayamvula says, which means they will be more viable financially and have more opportunities to work together in ministry.